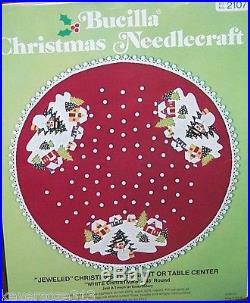 Bucilla's Vintage "White Christmas" Felt Tree Skirt or Table Cover Kit 45 Large RARE Mint Condition Completely Sterilized. Now is a great time to get started on your stockings for next year or gifts throughout the year. "White Christmas" a very old, vintage tree skirt shows a little village with Frosty standing to greet everyone. It has 3 evenly spaced scenes and would be very easy to open the back to wrap the skirt around your tree vs. Sitting the tree inside the skirt. It has Frosty standing in front of the snow-covered village with snow falliing all over the villages with the design encircling the tree skirt. There is white pom pom braid around the edge of the skirt. The bright red skirt is accented with white sequins is very bright and colorful. There are white sequins and beads over the village to represent the snow. The circular design which goes completely aroung the tree skirt adds a little sparkle to the tree skirt when completed. If you are one of those people that loves the traditional red and green Christmas, this is perfect. This is a very colorful, extremely old vintage kit but there is no designer listed. It would just be guessing if I gave a year but it was Bucilla. When completed, this tree skirt is 45. This kit contains stamped felts (50% Wool and 50% Rayon), decorative trimmings, cotton floss, colored sequins and beads, needles, simple to follow instructions and directions. Everything you need to complete the stocking are in the kit except for the polyester filling or the filling of your choice. 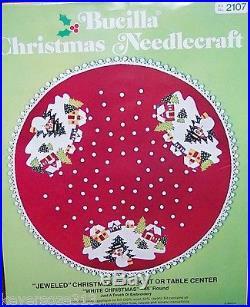 This is a large tree skirt kit to make a 45 tree skirt and not a finished item. This vintage kit is so old that it must be dry cleaned and not washed like they were a few years later. The new Plaid kits are not washable and the felts do tend to bleed. Since this kit was bought on the secondary market, it has been sterilized and guaranteed germ-free. It is for this reason that my kit cost is slightly higher but definitely worth it. It is sterilized in the same manner that surgical instruments are sterilized. You can be sure that you will not be receiving anything but a perfect kit from me. In case of loss or damage, please contact me and I will file all claims. I wrap all of my kits in white tissue and label them so that there is no chance of the kit opening during transit and losing a bead or sequin. It preserves the cleanliness of the kit as well. All of my kits are from a clean, smoke-free, pet-free environment except for the vintage kits. I do take extra precaution on all vintage kits or opened to maintain they are germ-free. Since vintage kits go through so many hands, it is for this reason that my kits cost a little more because they are completely sterilized using the procedure that is used in a surgical procedure. I don't just wipe down the outside of a package with a germicide. I sterilize completely throughout the kit. There is a grommet hole, a hole which is used for displaying the kit, ornament, etc. Germs and bacteria can go through the grommet hole on any kit. It is worth it to make sure your kit is germ-free. I will never sell you an incomplete or dirty kit. If I receive a kit that has a torn, dirty or in an extremely worn plastic package, I will replace it with a new bag and professionally heat seal it. Please wait for a combined invoice if you are wanting more than one kit. Tree skirts and Home Decor such as wall hangings and Advent calendars vary depending on weight. Please visit my store, "Christmas is in the Heir" for the rare, hard-to-find or BIN kits. If you are looking for a particular Bucilla stocking kit, please let me know. When leaving feedback, if you feel that you have received anything less than five star service from me, please let me know. I will try to resolve your issue. Be sure to add me to your favorites list. Check out my other items. Please subscribe to my newsletter to keep up with the latest acquired kits and any promotional for newsletter members. This is subject to change at any time. Any location that would be in violation of any U. Economic or trade sanctions including OFAC Restricted Countries. Coverage is NOT AVAILABLE to Russia or the Russian Federation. This list is subject to change. 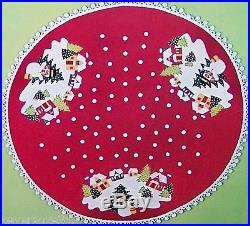 The item "Bucilla WHITE CHRISTMAS Vintage Felt Tree Skirt KitTable Cover Sterilized 45" is in sale since Thursday, January 28, 2016. This item is in the category "Crafts\Needlecrafts & Yarn\Embroidery & Cross Stitch\Hand Embroidery Kits\Other Hand Embroidery Kits". The seller is "ginger415" and is located in Little Rock, Arkansas. This item can be shipped worldwide.